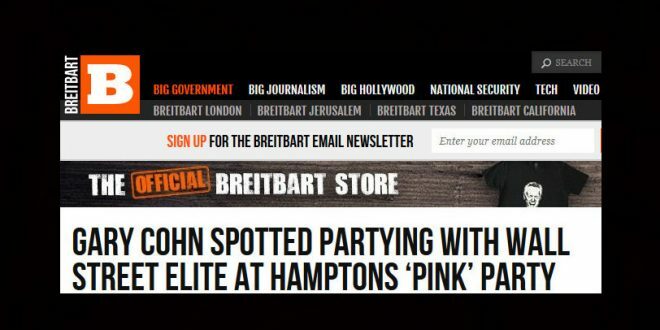 Breitbart Attacks "Elitist" Trump Advisor For Attending Breast Cancer Fundraiser Once Attended By Trump - Joe.My.God. You can take Gary Cohn out of Wall Street but you cannot take the Wall Street out of Gary Cohn. President Donald Trump’s top economic adviser escaped tumultuous Washington, D.C. this weekend to return to his old stomping grounds: the Hamptons social scene, where elite Wall Street relocates for summer weekends. Cohn was long a staple of the elite parade of lawn parties that take place each weekend in the Hamptons, a cluster of ultra-expensive beach communities at the east end of Long Island. And this weekend he made a return to that scene, attending the Breast Cancer Research Foundation’s Party for Pink in Bridgehampton. Cohn’s wife made a paddle board for the charity auction. It was decorated with pink flowers and silver and gold flourishes. Bloomberg’s Amanda Gordon reported that it went for $6,900. Cohn was dressed in a pink shirt, white pants, and white shoes. Five seconds of googling shows that snobby elitist Trump himself attended this fundraiser with Melania at least once.